First repository, embedded-arm-gnat-build, contains the build scripts for GNAT (arm-none-eabi target; the script for binutils is missing, you need to install it manually). The second repository (embedded-arm-gnat-rts) has simple runtime for GNAT. It is almost direct copy of Lucretia's TAMP RTS. The runtime does not have install script, so after building it you need to install the runtime manually. The third one (gnat-arm-app-skeleton) contains the actual application. I loaned the startup files from mbed project, in case you wonder why there are so many C and assembler files. They could be optimized to two simple assembler files, but I haven't got that far. -- the loop. Notice the new Ada 2012 aspect syntax. 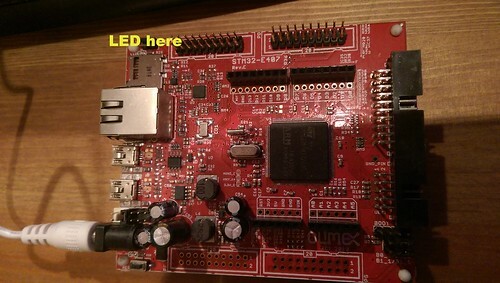 The program blinks various leds at port C and port D.
On Olimex STM32-E407, which I used for testing, the status led is at port C13. If you use the same board, you should see the led blinking. Note: My build scripts, GNAT runtime for ARM Cortex-Mx, and other Ada code are still very rough. I just wanted to try is it possible to use FSF GNAT for ARM Cortex-Mx development. As my time permits, I will continue to improve things, but it will take some time.